TDI Acrylic, Static Dissipative Acrylic and Stainless Steel Desiccator Cabinets provide the highest quality and most durable construction to meet the requirements for Cleanroom, ESD and assembly component storage applications. TDI also offers Application Specific Acrylic and Static Dissipative Desiccators, including Wafer Carrier, Waffle Pack, SMT Tape/Reel, Bonding Wire and Photomask Storage Cabinets. Acrylic desiccators utilize 1/4″ acrylic, an inherently inert and clean non out-gassing material. All cabinets include unique cabinet door design for minimum door weight with maximums seal integrity and durability. All acrylic cabinets include our unique Ultra Nitro-Flow with notched compartment walls and floors for a uniform humidity control in all compartments. TDI’s Nitro-Save® Humidity Control Monitor is a solid state sensor system for accurately controlling pre-set relative humidity. Static dissipative acrylic desiccators provide complete electrostatic discharge protection for ESD sensitive cleanroom and assembly component storage. 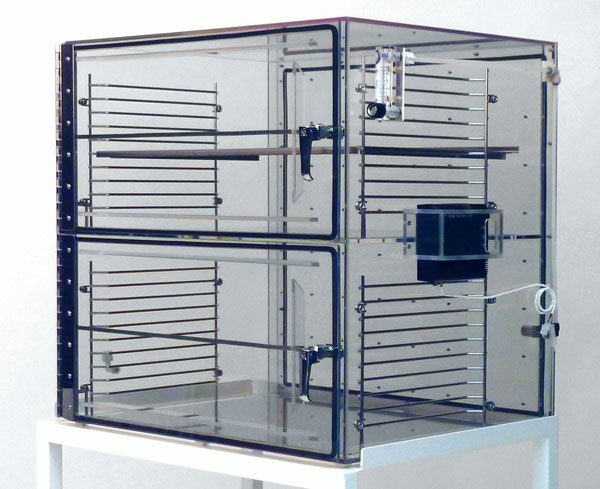 These static dissipative acrylic desiccators offer stainless steel shelves, racks and plates which are common grounded to the desiccator and wire connected to hard ground. Stainless steel plates are recommended on the floor of each compartment to enhance grounding and protect the static dissipative acrylic surface from abrasion. Stainless Steel Desiccators provide clean, high density storage for both clean room and assembly applications and are designed for maximum weight capacity and long term durability. These cabinet are available in a Table Top, Stacked Modules and Multi-Chamber Models. High Density Storage – Twice the Capacity of Competitive Brands!